Hello and Welcome to our Sunday Night Blog Hop!! This week we are revisiting the Christmas chapter - sometimes it's great to get a bit of a head start on the card making for the Christmas season, so hopefully we can inspire you with our take on some of the cards in our catalogue as we Copy and Selectively Edit the Annual Catalogue. 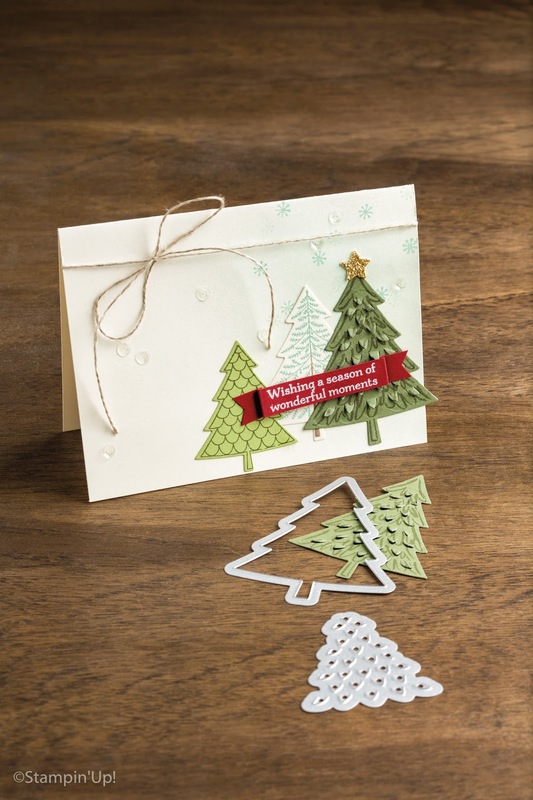 I"ve gone for this little card featuring the trees from Peaceful Pines. Now, I don't have this stamp set, but I DO have a new stamp set Thoughtful Branches available ONLY for August - you'll be seeing LOTS of this gorgeous set in these next couple of weeks. I love it!! I've used one of the tree clusters, and added some dotty adornment to my spartan trees. The greeting comes from our lovely hostess set - Time of Year. I've used a sponge roller with Soft Sky for the background (still practicing with this new toy!!) and added the same linen thread and metallics sequins as featured in the Catalogue Card. The lovely shiny star on the top of the tree is one of our new Metallic Enamel Shapes - they are sooooooo lovely!!! Now it's time for you to continue hopping around the whole team and be inspired over and over, and then you can create your card too and add it to our monthly gallery!! Both links above will help you on your way. And if you want to see the list of the whole design team, just use this one here. Your card is lovely. The soft stars in the sky look beautiful. This is my this is my kind of Christmas card, Julia. It's so achievable for any level of stamper but so pretty. Those trees work beautifully. Love your version Julia, don't you just love that new stamp set! Very pretty card Julia, I love the colours you've chosen. Adore the soft sky background, makes me want to try my own sponge roller (still in the box). Lovely card!! I love the banner too!